RSSmeme has been slowing down over the last few days and my brief analysis looks like it's due to a lot of people using the search RSS feeds and API. Unfortunatly I've had to disable the search parameter for any format other than the standard HTML that RSSmeme displays. I'll hopefully be able to restore this soon but in the meantime all of you using complicated Yahoo Pipes filters with RSSmeme might not be seeing results that you'd expect. Sorry. Update: The personalize feature has also been disabled while I test things out. Update: RSS and JSON re-enabled. Personalized feature still disabled. Exactly 10 days ago I wrote about RSSmeme crossing the 20000 user barrier. 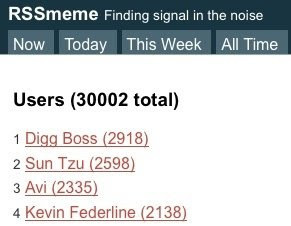 Today RSSmeme has over 30000 users! Now that RSSmeme is being fed data from Digg it only makes sense to let users Digg right back. Next to the "share" link is a new "digg" link! RSSmeme Customize Tab from Benjamin Golub on Vimeo. The customize form will get more filters over time; this is just the beginning! RSSmeme Popular Stories from Benjamin Golub on Vimeo. RSSmeme isn't a Google Reader only service anymore. Last week I wrote about leveraging the FriendFeed API to make RSSmeme gather data even faster. What I didn't tell you was the second part of that development would enable RSSmeme to support every service that FriendFeed supports. For the last few days RSSmeme has been counting all of your Google Reader shares in addition to stories you share on Delicious, Digg, Diigo, FriendFeed, Google Shared Stuff, Magnolia, Mister Wong, Mixx, Netvibes (which our friends at ReadBurner support), and StumbleUpon. The only service missing from that list is reddit and I hope to be able to add them ASAP. While I love Google Reader I know that it isn't perfect for everyone. RSSmeme is about "finding signal in the noise"; now that signal can come from anywhere! Looking at the leaderboard it looks like Digg Boss is a very prolific digger; digging many stories that make it to the top of RSSmeme. I'm happy to report that his diggs now count as a vote in RSSmeme! And it requires absolutely zero registration to get started. If you have a public FriendFeed account then RSSmeme is already counting your shares! If you share the same story using multiple services it will only count the share once to keep things democratic. You may have noticed stories reaching the RSSmeme front page without any author, source, or excerpt. This is because the story wasn't (or hasn't yet been) shared through Google Reader. Once someone does share it via Google Reader the extra meta data will appear. So share the way you want to share; and you can bet that as FriendFeed adds more services so will RSSmeme! RSSmeme is now tracking over 20000 users. A recent update (you'll hear more about it later) was responsible for this large jump in users and it will only continue to grow. 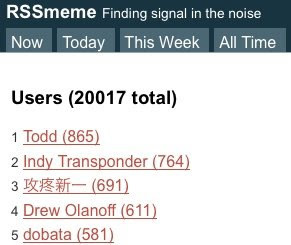 The more users in RSSmeme the better and quicker it is at "finding signal in the noise". Happy sharing! RSSmeme received an email yesterday afternoon threatening legal actions unless I remove a blogger's content from the site. I always believe in "better to be safe than sorry" so I removed the content and have disabled full content republishing on RSSmeme. Most people didn't even know that you could get full content on RSSmeme since the default was to show extracts but yes it was possible and yes there is a Google ad. I am not saying that full content is gone for good. I need to do some research and discover if I can renable it; perhaps if I remove ads on pages that serve full content? If you know anything about this please reply in the comments or via email: bgolub@rssmeme.com. I wanted to thank the FriendFeed community for being so supportive. I was actually out at a jazz festival when my phone buzzed to tell me I had an email and so I posted to FriendFeed using FF To Go not thinking it would stir things up this much. A huge thank you to Louis Gray who immediately made himself available via phone to get the full story and write up a very supportive post on the matter. I've added a recent comments box to the sidebar courtesy of Disqus. This is something I should have done a long time ago; they make it so easy! I've loved using Disqus for RSSmeme (they also power comments on this blog). They even featured RSSmeme on their blog when I whipped together the dynamic slide down Disqus comments you see in RSSmeme. Chris Wetherell, the creator of Google Reader is graduating from Google. I wanted to take a moment to thank Chris and the rest of the Reader team (especially Mihai who's been very helpful) for all of their hard work. Without Google Reader there would be obviously be no RSSmeme but more personally I'd be completely lost on the web. I practically live inside Google Reader (it and Gmail are permanently open in Firefox). Good luck Chris; although if anyone doesn't need luck to succeed it looks like it's you! RSSmeme now has an official blog. It's about time I stop using my personal blog for RSSmeme updates and give it something more permanent. Please subscribe to the RSS feed to receive all of the updates.